Dr. Jerry Vines is the former Southern Baptist Convention (SBC) president and pastor of 28,000-member First Baptist Church of Jacksonville. His lifetime of experience teaching others has inspired him to lead you on a journey through the Bible. With the NKJV Vines Expository Bible you will gain observations and understanding straight from a pastor's heart. This resource is entirely based on lessons and sermons from Jerry's life and ministry. It will provide you with a unique, passage-by-passage guide through every single book of the Bible, making it applicable to your daily life. Creative, practical, applicable, but never anything less than true to the actual text of Scripture, has been the hallmark of this unparalleled pulpit virtuoso. . . . I love Dr. Vines and I'm so glad he’s opened up his vault of knowledge for all of us. 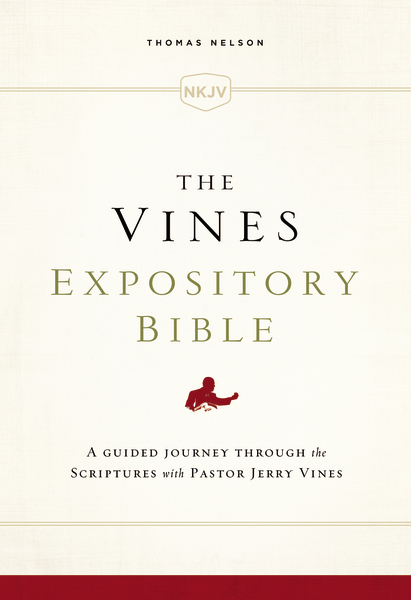 Jerry Vines has been a faithful expounder of scripture for over four decades. He has the rare ability to possess the passion of a prophet and the erudition of a scholar and it’s been a big influence on shaping my own approach to the pulpit. It’s good to see many of his insights and life-changing approaches to text captured in this one helpful resource. Having known and loved Dr. Jerry Vines for decades I am blessed to see the fruit of thousands and thousands of hours of personal devotion and Bible study now contained within the covers of the Vines Expository Bible. The man behind the message is real. He is as straight as an arrow theologically; his reputation is spotless and his character is beyond reproach. Only God knows how many believers in the coming years and decades will be built up and encouraged in the faith for having studied God's Word with this amazing tool. Read it and reap!